In the box : Blackjax Module, Siren, PlainVeiw 2 Valet Switch, LED, wire set. Quick recommendation : Highly recommended, in particular for late night driving in crime prone areas. Downside : When activated, codes must be input every time driving starts. Crime rate keeps increasing every year. Taking security measures is a wise choice to prevent ourselves from becoming another victim, at least to reduce the possibility of being one, or to reduce possible loss /harm. Newer cars come with updated technology to prevent car theft, such as immobilizers. With the immobilizers, thieves can’t (or it is fairly difficult for them to) steal the vehicle. It is a very effective and good measure to prevent the crime at the first place. But immobilizers /car alarms alone cannot help during a carjacking event. During a carjacking, an carjacker may forcefully take the car from its owner, which could also include threat using weapons. An anti-carjacking device may help for this situation. The Clifford Blackjax 5 is specifically designed to prevent carjacking. The contains the Blackjax module, a sirene, two wire harnesses, a LED status indicator, and a Plainview Valet Switch. Installation must be carried out by the authorized dealer (as with other Clifford products). Thus the price includes installation fee. System is automatic and always working. Engine won’t run even if the system is removed. Selectable rpm /speed /manual ignition off engine disable. PIN Code is required to reset. Auto-immobilization (engine disabled 30 seconds after ignition is off). Can be programmable from PC using using CliffNet program (requires cable). Connection to horn as addition to the siren. With the system activated, during a carjacking attempt, the driver does not need to push any button or do anything. The driver just needs to get away from the car to get to a safe distance. The system will do the rest. Then after a short distance, the system will emit warning by beeping the siren and flash brake lights. And twenty seconds later, it will shut down the engine and blare the siren. On this phase, the only way to defeat the system and get ignition back is by inputting PIN codes on the PlainView switch. If the PlainView switch is hidden, it will be even more difficult to defeat. he one to four digits must be inputted on the only-two-button switch. And after three incorrect entries, the system will ignore further entries for one hour. Even of the thugs accidentally bump into the correct PIN numbers, it will not work. Hopefully, with the engine died, siren blaring and lights blinking (and finding that the remote fob does not give any effect, for the system that comes with an alarm system), the carjacker will leave the car. The owner, with help of others, can recover the car safely. 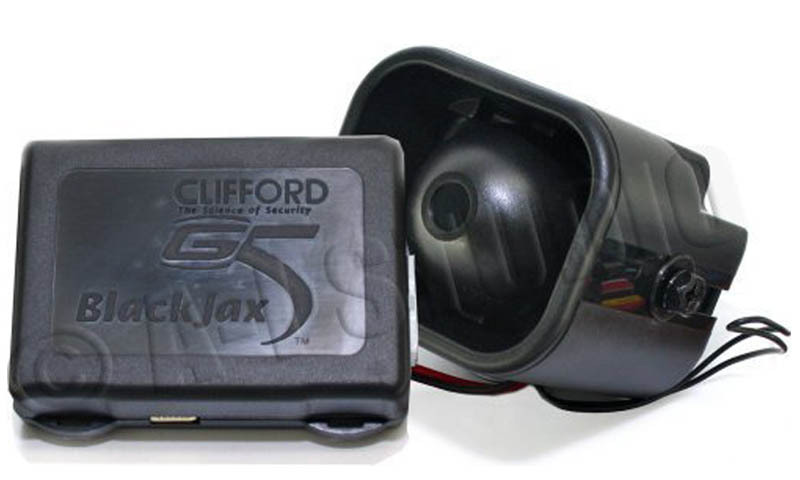 Conclusion: Overall, the Clifford Blackjax 5 is a small investment against carjacking. It is quite useful, yet simple to operate when the bad thing happens. You can get one at amazon.com or amazon.co.uk. There are also Clifford alarms that include similar Blackjax feature, such as the Clifford IntelliGuard 770 (US) or the CLIFFORD AVANTGUARD 5.5 (UK) . A little inconvenience though: Since the system is always on when activated, specific steps must be made when the owner himself wants to drive the car without getting the protection triggered. Small inconvenience to pay for the protection. 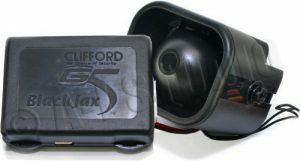 The Clifford Blackjax is available at Amazon.com or amazon.co.uk. You mean cars with engine start /stop button? I think it can. It works only by controlling the ignition wire, without interfering with other electronics. So it should work with any gasoline vehicle. Any authorized Clifford installer should know how to install it.